Law professor and copyright expert Chris Cotropia could have tried to hide his glee during a panel discussion in March, but he didn’t see why he should. It’s not every day a law professor sits with one of his musical idols to talk about intellectual property. Cotropia, director of the Intellectual Property Institute, was joyful as he shared a stage with Rock & Roll Hall of Fame inductee Hank Shocklee to talk about the legal implications of sampling. Sampling is the reuse of sound snippets in new recordings, a practice that can cause copyright disputes. As a member of the rap group Public Enemy, Shocklee broke new musical ground with the practice, layering sample upon sample to make records in the late 1980s and early ’90s that are now considered classics. Cotropia said that long before becoming a legal scholar, he was a Public Enemy fan. Shocklee provided the audience with an artist’s perspective on sampling — what it adds and why it’s appealing. Cotropia was there to explain the legal peril it can cause artists. In one memorable exchange, Shocklee made a case for distinguishing between minor and extensive sampling. 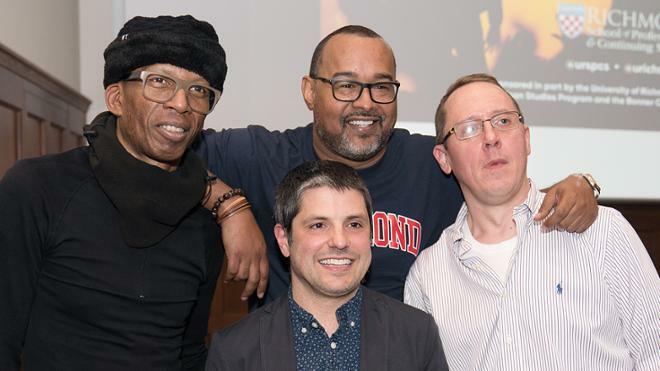 This public event was part of a spring semester course called The Voice of Hip Hop in America offered by the University’s School of Professional and Continuing Studies.